John Flynn remained on the home farm in Iowa until his twenty-sixth year, and was there married, November 27, 1876, to Sarah E., daughter of John and Emily (Eggleston) Omstead, and fifteenth in order of birth of their seventeen children. The Omstead family moved from Canada to Illinois, where Mrs. Flynn was born, in 1857, and ten years later came on into Iowa. Her parents are deceased, but she has three brothers and one sister surviving In 1878 Mr. and Mrs. Flynn came with their small son, William, to Rush county, Kansas, where they remained one winter, then went on to the Pan Handle of Texas, on the south side of the Canadian river. In the fall of 1883 they came to Custer county, Nebraska, with their three children. They settled on the southwest quarter of section thirty-five, township thirteen, range eighteen, on which Mr. Flynn filed an entry in the spring of 1884. Of the settlers who had located in the neighborhood prior to Mr. Flynn none now reside there. Mr. Flynn has been closely identified with the growth and development of his portion of Custer county and has been especially helpful along educational lines. In politics he is independent. He helped organize school district number nineteen, serving several years as a member of its board, and helped in building the school house. He has always done his part to advance the best interests of the community and he and the other members of his family are well and favorably known and have many friends and acquaintances. Mr. Flynn and his wife now reside on the southwest quarter of section twenty-three, township thirteen, range eighteen, which has been their home since the fall of 1900. Eleven children have been born to Mr. Flynn and wife: William W., born in Iowa, a pioneer of Custer county, married and living on the homestead farm, has one child; Albertis S., born In Kansas, married and living on a Kincaid homestead in Logan county, has three children; Mary M., born in Texas, wife of Oliver Trumbull, living on a Kincaid homestead in Logan county, has three children; Ervin M., born in Custer county, still resides there, and is married; John R., married and living in Custer county; Sadie R., wife of Carl Holster, of Custer county, has one child; Lawrence O., Nellie Belle, Sylvia Irene, and Cyril Leonard, born in Custer county, live at home; one child is deceased. Hector Downer [sic], who resides in section twenty-nine, township thirty-one, range two, where he has a good farm of four hundred acres and a comfortable home, has spent over nineteen years of his life in Knox county. Mr. Downie was born in Scotland, that event taking place in Campbelltown village, Kentyree township, Argyle county, in 1869. He grew to his young manhood in his native land, and at the age of twenty-two years, in 1890, left Scotland to come to America, embarking on the steamship "Gallia," coming by way of Liverpool to New York City. After landing on American soil, Mr. Downie worked at whatever his hands found to do; later, in 1892, coming to Knox county, Nebraska, where he bought one hundred and sixty acres of land from Mr. William Miller. He first lived in a dugout two years, then built a good frame house, and has steadily improved the farm until it is now one of the best improved places in his section. In 1899, Mr. Downie was united in marriage to Miss Alta Mackey, and Mr. and Mrs. Downie are the parents of five children, whose names are as follows: Aleck, Harold, Etta, Leslie, and Ellen. Mr. and Mrs. Downie and family enjoy the high esteem and respect of all who know them, and in their pleasant home are surrounded by a host of good friends and acquaintances. Among the many who took up their residence in Nebraska shortly after the memorable flood of 1881, we mention S. A. Stark, a prosperous stock breeder of Niobrara. He arrived in the following June and immediately filed on a homestead situated seven miles southeast of the then small village, remaining about one year, at which time he sold the relinquishment and rented a place in the northwest part of Niobrara, known throughout the section for its fine grove. He purchased his present place in 1898, consisting of twenty-seven acres of fine land lying just north of town, also secured a lease on one hundred and seventy-five acres adjoining, of which he has made a comfortable and pleasant suburban home. His attention is devoted principally to horsebreeding, and he owns some of the finest Percherons to be found in this part of Nebraska. Mr. Stark first saw the light on the first day of January, 1859, his birthplace being near Erie, Pennsylvania. His parents were C. N. and Dora (Turner) Stark, both natives of New York state, the former dying in Pennsylvania in 1898. Our subject lived in his native county until he attained the age of twenty years, then came west to Black Hawk county, Iowa, joining a brother who had settled in that state several years previous. After two years spent in that vicinity he went to Knox county, Nebraska, which has since been his home, his mother joining him here in 1901, and making that her home up to the time of her death, which occurred in May, 1909. Of her seven children, four died while the family lived in Pennsylvania. One daughter lives in Black Hawk county, Iowa, and the other son has gone to the extreme west, making his home in Washington state. always been very fond of sports, riding to the hounds perhaps more than any other man in this part of the country, and many are the jack-rabbits or wolves his pack has brought down. At times when his hounds seemed to be getting the worst of a scrimmage, Mr. Stark had no hesitation in dismounting and helping finish a wolf with his bare hands. He also has killed quite a number of deer here, and as late as 1890 shot two in the locality, but since then few, if any, have been seen here. Mr. Stark was married in Niobrara, in June, 1888, to Mrs T. G. Hulliben, who was Henrietta Paxton. One son, Walter, was born of their union. He is a graduate of the high school class of 1907, later taking a course in the business college at Waterloo, Iowa. During the early months of 1910 he spent considerable time in California, visiting most of the principal cities in the Golden State, and gaining in this manner a valuable lot of information through travel and contact with people whom he met. Mr. Stark has been a lifelong republican and active in party politics. He is a total abstainer as regards liquors and tobacco, but like many of our broad-minded westerners, he uses very forcible expletives with ease when occasion demands, and his feelings need to be relieved. In 1909 he made a visit to his native state for the first time in thirty years, but found himself a stranger in a strange land, as is usual with those returning after many years to the home of their youth, and the names of many of his associates of his boyhood were found on the gravestones in the local cemetery. Moses Welch, deceased, was born in Dorsetshire, England, about 1814, and grow up to his manhood years in England, where he was married to Miss Harriet Rollins; and about 1847 Mr. Welch and family of wife and seven chidren crossed the ocean in a sailing vessel, landing in New Orleans, from whence they came by steamboat to St. Douis [sic], where they resided about two and a half years; then going to Madison county, Illinois, residing there three years, and finally purchased a small farm in Macoupin county, Illinois; and in the spring of 1857, breaking up, and leaving home March 3, came by ox team to Florence, Douglas county, Nebraska. Mr. Welch and son, Jonas, left the family at Florence, and came on the old Mormon trail road to what is now Nance county, and located near Jenoa [sic], putting in a thirty or forty-acre crop of corn, buckwheat, potatoes, etc., breaking raw prairie with ox team; and in the fall of the same year Mr. Welch returned to Florence for his family. They farmed on this land until the fall of 1859 when they gave up the squatter's privilege on this land, as the government had made an Indian reservation of fifteen by thirty miles; and the Indians were moved from Saunders county to this reservation, young Jonas Welch being one of those assisting in the removal. The Welch family moved to a plat of land called "zig-zag" with other families who had also moved off the reservation, the Welch family remaining there-some three years. Moses Welch worked for the government as blacksmith for some seven or eight years, then moved into what was Platte county and is now Colfax county, taking up a homestead in 1868, where he resided until the time of his death, July 12, 1890. Mr. Welch was one of the pioneer settlers of Nebraska, and passed through all experiences of those days, and was a factor in the upbuilding of this new part of United States domain. Mrs. Welch died several years prior to her husband's death, a woman of the pioneer days, known and esteemed through all those years by the original few and coming many. Three of the Welch family survive and all live in Nebraska: Jonas Welch, a banker of Columbus, Nebraska, Henry Welch, living on the old homestead; and Mrs. Ellen Fulton, living in Campbell, Franklin county, Nebraska. Jonas Welch, now residing in Columbus, Nebraska, is vice president of the Commercial National Bank. 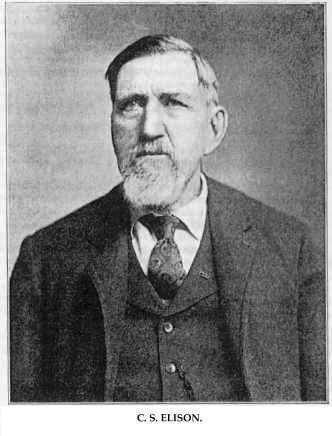 Mr. Welch remained with his father until about 1860, When in May of that year he took a trip to Pike's Peak, Colorado, during the gold excitement, but in the fall of same year returned to the home place, going to work for the government on the Pawnee Indian reservation, and was in government employ ten or twelve years. Mr. Welch was married December 25, 1861, by the Rev. H. J. Hudson, to Miss Margaret Shackelton in Genoa, Platte county, the home place of her father and mother. In the spring of 1870 Mr. Welch and family moved to Colfax county, and in partnership with J. P. Becker, built the second water-power grist mill in Nebraska, and Mr. Welch for seventeen years lived in Colfax county, where he followed farming, stock-raising, etc., and was a member of the firm of Becker & Welch in the grist Mill. Mr. Welch disposed of his Colfax county interests in 1887 and moved to Columbus, where he purchased an interest in an elevator and was in the grain business a few years. He has had numerous business interests in Columbus, and has large land interests, owning about one thousand five hundred acres located in Platte, Merrick, and Holt counties. Mr. Welch assisted in organizing, the Commercial State Bank, which became a National Bank later, of which Mr. Welch is now vice president. Mr. Welch in past years served as county supervisor in Platte county; in the city council of Columbus; and also on the school board of that city. He is active along all business, political, educational, and social lines. liam J., married, has six children and lives on the original pre-emption claim of his father; Henrietta, wife of Harry C. Newman, has two children, and resides in Columbus; Caroline Elizabeth, wife of George Galley, has four children, and lives on a farm near Columbus: Charles A., teacher in the public schools at Columbus, is married and has two children; Mrs. Martha A. Watts, teacher in the public schools, resides at home; and Robert Moses, married, has two children, and lives on a farm. Mr. Welch and family enjoy the respect and esteem of a large circle of friends, and have a pleasant home. Mr. Welch is a member of the Masonic order, and in politics is a democrat. He is now the eldest living resident of the original pioneer settlers of Platte county, and has had a varied and busy life since going out for himself, and now over seventy-five years old, is still active in business circles, a than widely known who has had a wonderful frontier and pioneer experience. At the age of sixteen years Mr. Zachry left home and worked on a farm in St. Clair county, three years at a wage of nine dollars per month. October 25, 1879, he left Illinois, and moved to Ashland, Saunders county, Nebraska. He found employment in that county feeding cattle for a stockman, remaining there until August, 1884, when he came to Custer county, and secured a homestead on the southwest quarter of section six, township seventeen, range twenty-two, which has remained his home since. He is one of the comparatively few who retain possession of their original homesteads, and he now has a well-equipped farm and gives much attention to the breeding of thorough-bred Shire and Percheron draft horses. He is a self-made man, starting west with no capital and winning a high degree of prosperity and success. He had only ordinary educational advantages as a boy, but has always kept abreast of the times in so far am was possible, and is now a well-read and intelligent citizen. He has a high standing in the community and his judgement in many matters is highly regarded. Mr. Zachry was married in Saunders county, January 1, 1884, to Miss Lilly Bachelor, daughter of Relander and Adeline Bachelor, and eight children have been born of this union, of whom seven survive: Lulu, wife of Ashton C. McGuire, living on the old Klump farm in Custer county, has two children, a son and a daughter; William and Edward, at home; Nidgal works in Merna; Evans, deceased; Louis, Bertha and Myrtle, at home. All were born on the homestead except Lulu, who was born in Saunders county. Charles S. Elison, a retired farmer of Ansley, Nebraska, is honored as a veteran of the Civil war, and has been prominent in prompting the progress and advancement of Custer county, for many years. A portrait of him will be found on another page. He was born in Luzerne county, Pennsylvania, August 3, 1832, a son of Samuel and Catherine (Stout) Elison, the father of English extraction and a native of New Jersey, and the mother born in Pennsylvania. He died in Summit county, Ohio, September 7, 1866, and she died in Pennsylvania, September 20, 1841. Mr. Elison was reared in his native state, received his education in the local schools and worked for a time on the home farm. When about eighteen years of age he went to Philadelphia and learned the trade of painter. In 1855 he enlisted in the United States regular army, and served five years on the frontier. In the summer of 1861 he enlisted in the Federal service of the Civil war, in battery K, Fifth United States Artillery, serving until October, 1863, and receiving his discharge at Frederick City, Maryland. He participated in the battles of Antietam, second Bull Run, and Gettysburg, losing a thumb in the last-named. He also took part in various minor engagements. After the war he returned to Pennsylvania, and on March 19, 1864, married Charlotte J. Wolverton, also a native of that state. land into village lots, erected store buildings and started the town of Algernon, of which he served some time as postmaster, and which grew to be a prosperous and thriving village. However, when the burlington & Missouri railway was built through the county the inhabitants of that place removed to MisIey or Mason City, and the life of the village was gone. Mrs. Elison died on the home farm February 8, 1888, survived by her husband and the following seven children: Emma, wife of W. A. Beard, of California, has nine children; Agnes, wife of John Daily, of Custer county, has three children; O. Howard, married and living near Mason, has three children; Florence is a teacher in Colorado schools; as also is Alice; Laura and Bertha, at home. In 1889 Mr. Elison was appointed postmaster of Ansley, in which office he served four years. He has filled various public offices besides, such as justice of the peace, was for three terms county supervisor, was also constable, and helped very materially in organizing school district number thirty. About four years ago he sold his farming interests and retired from business life. He is well known as a successful man of affairs and is recognized as a public spirited, useful citizen who has been closely identified with the best interests of his community. He has many friends and is highly esteemed. He has been a member of the Odd Fellows, fraternally, for the past forty-six years, and also is one of the early members of Steadman Post, number one hundred and eighty, Department of Nebraska, Grand Army of the Republic. Some of American's best citizens claim their nativity in far-off lands across the sea, and their immigration to the home of the stars and stripes has added many strong and sturdy characters to outpoulation [sic]. Such a one, is Rudolf Boetger, who since 1888 has been closely associated with the agricultural interests of Pierce county, Nebraska, He is regarded its a man of sterling qualities by all who know him intimately. Mr. Boetger was born in the village of Wachendorf, near Hamburg, Germany, March 30, 1864, a son of Claus and Mary (Westfall) Boetger, both natives of Holstein, then a Province of Denmark, the father being born August 9, 1818, and following the occupation of farming in his manhood. The mother was born in 1828. Our subject received his schooling in the old country, and engaged in farm labor until emigrating to America. In 1888 he left the fatherland, sailing November 3, front Hamburg to England, and thence to New York in a vessel of the White Star line. After landing, he came to Nebraska, reaching Norfolk the twentieth of November, and found work in the vicinity until spring. For two years he worked by the month, and then rented until the spring of 1902, when he bought three hundred and twenty acres in section thirty-six, township twenty-eight, range two, which he owned until the spring of 1911, selling at that time for over a hundred dollars in acre. Mr. Boetger was married May 6, 1889, to Miss Bertha Fedder, to which union seven children have been born, whose names are as follows: Heinrich, Julius, William, Richard, Emil, George, and Meta. Mr. Boetger has been in the main successful since coming here, although he has met with loss and disappointments on account of the failure of crops by drought in 1894, and in 1905 had the misfortune to lose a large portion of his crops by hailstorm which swept the locality. Mr. Boetger is a member of the Modern Woodmen of America, and Sons of Herman lodges, and worships in the German Lutheran church. Mr. Boetger has not only watched the development of his county from the early days of its settlement, but has aided to his utmost the advancement of the resources of his locality. The name of James C. Cornfield is a familiar one among the residents of Howard county, Nebraska. Prior to his demise he was recognized as one of the representatives farmers and an old settler of this section where he had resided for the past thirty years. Mr. Cornfield was born in Monahan county, Ireland, in August, 1841, and moved into Scotland with his parents when he was four years old. He was married to Miss Bridget McMahan in Scotland, in February 7, 1861, and came to America by himself in May, 1865. He was joined by his wife and two young sons in August, 1866, at Massillon, Ohio. After a residence of two months in Ohio, the family removed to Illinois, remaining there ten years, coming to Howard ounty [sic], Nebraska, in May of 1876; the family then consisted of himself, wife, and six children. Upon coming to Howard county, Mr. Cornfield homesteaded on northwest quarter section ten, township thirteen, range nine, in St. Libory district, being among the first settlers in this portion of Howard county. Mr. Cornfield made this homestead his continual residence until the time of his death, April 25, 1906. Mr. Cornfield was always prominent in his locality, was a good citizen and had many friends. He is survived by his widow and seven children: James, Patrick H., Annie, who is now Mrs. John O'Hallern; Nellie, John, Lucy, and Bessie, being married. Mary, who was the wife of Charles Curtis, is now deceased, and a son, Frank, died in infancy. Mrs. Cornfield lives on the old home farm, her son John and wife, being with her. about ten years, Howard county, has been his home In April, 1898, he enlisted in the Second Oregon Regiment in Portland, Oregon, served over a year in the Philippines, and was discharged in August, 1899. On January 12, 1909, at St. Libory, Mr. Cornfield, was married to Miss Annie Rock, who was born in Howard county, her father and family being old Howard county pioneers. Mr. Cornfield is a young man of good qualities and has many friends. He is now farming the Cornfield land in St. Libory district. Frederick G. Hather is a native of Dubuque county, Iowa, his birth occurring the twenty-seventh day of May, 1858, and he was second of the ten children in the family of George T. and Sarah Jane (Carter) Hather, who had four sons and six daughters, Fred being the eldest son. Mr. Hather grew up in Dubuque county until his nineteenth year, then going into Montgomery county, Iowa, where his sister Elizabeth, Mrs. W. A. Anderson, lived. Mr. Hather, in company with Mr. and Mrs. Anderson, drove through from Red Oak, Iowa, to Valley county, Nebraska, in March of 1879, where Mr. Anderson took up a homestead. The next spring Mr. Hather also took. up a homestead in Valley county, living there until 1894, following farming and stock raising. On March 3, 1882, Mr. Hather was united in marriage to Miss Delia Holman, in Ord, Nebraska. Mrs. Hather is a native of Canada, her parents, William and Mary (Buel) Holman, coming to Valley county, Nebraska, in 1881; her father and mother are both deceased. Mr. and Mrs. Hather have six children namely: Lillian, wife of John Summers, they having one child and residing in Valley county; Ernest, who is the eldest child; Myrtle, wife of Frank Kenmont has one child and resides in Los Angeles, California; Mamie, who is the wife of Charles Kear, lives in Grand Island, Nebraska, has one daughter;. Melvin, and Irene who reside at home. The children were all born in Valley county and the family are known along social and other lines, and have the respect of many friends. In 1894 Mr. Hather and family left the farm and moved into Ord, where Mr. Hather engaged at his trade of blacksmith and woodworker, and has remained in this business until this date having one of the best known shops in Valley county, equipped with all the latest modern labor-saving machinery. Mr. Hather before leaving the farm, served his township as member of Noble township school board, he having organized the first school held in Noble township, and serving on its board until coming into the county seat to reside. Mr. Hather has been active along all progressive lines for the betterment of his county and state, always standing for the best interests along educational and moral lines. He is a member of the Christian church. In political affiliations he is a populist and fraternizes with the Independent Order of Odd Fellows, and the Ancient Order United Workmen. With Mrs. Hather he is a member of the Rebeccas and the Degree of Honor. George B. Hovland, formerly a real estate, loans, and insurance agent, in Newman Grove, Nebraska, was one of the well-known and influential citizens of that community. He resided in Madison county for many years, during which time he was engaged in farming for some years with pronounced success, now being owner of considerable valuable property in the city in which he made his home for so long, and also the surrounding country. Mr. Hovland was born on the island of Utsire, Norway, on September 20, 1846, and was the second in a family of six children, born to Mikkel and Lavina Hovland. He received a common school education, and at the age of fifteen years struck out for himself, going to sea and working on sailing vessels. He came to the United States on a trader prior to 1870, and was in the Boston harbor and also Philadelphia, returning on these ships to Norway. He left his native land for good in 1870, taking passage on a ship having three hundred passengers aboard, and while in the open sea off the coast of Newfoundland the ship came in contact with icebergs, and sprung a leak but by energetic work in using the pumps they were successful in landing on a small island on the coast of Canada. After this incident our subject took an active part with the ship's crew, and worked with them the remainder of the trip. They had a severe experience, being compelled to remain on the island for eleven days, when they were picked up by a small steamer and landed at Quebec. of that vicinity received their mail at Farwell, it coming by way of Columbus, and to avoid going so far after it, he succeeded in having the postoffice established at Newman Grove, in a small store of Gunder Hamre, who was appointed postmaster. In a few months our subject purchased the store and laid with this the foundation for a growing business, supplying the early settlers who came to this point for their groceries, etc. He became postmaster in 1877, and from the time of first settling here Mr. Hovland did much toward helping the newcomers, relieving hardship and suffering in hard times, furnishing seed, grain, and the necessaries of life to the less fortunate homesteaders, he being one of the committee appointed to aid those in need. He continued in the general merchandise business, also bought and sold land, and dealt in the stock. In 1888 he settled on a farm, and two years later, on account of failing health, went to the state of Washington, remaining for four years, then returned to Nebraska, and was afterwards engaged in different enterprises, finally becoming interested exclusively in the real estate, loan and insurance business. Mr. Hovland was married on April 23, 1876, to Miss Tina Simonson who was the eldest daughter of Simon Christianson, and to them were born four children; Louis, Annie, Lavina, and George, all married ad living in different parts of the west. Mrs. Hovland died in Newman Grove on November 9, 1886. Our subject has held different local offices, being deputy sheriff of Madison county in the early eighties, and was county surveyor during 1882 and 1883. He has also been for many years connected with the schools of his locality. Thomas W. Edwards, of Custer county, Nebraska, the owner of one thousand acres of farm land, is preeminently a self-made man and widely and favorably known in his part of the state. In the early years of his residence in Custer county he met and overcame the trying experiences and incidents of pioneer existence and he is a good example of what a man may become through energy and perseverance. He is a native of Herefordshire, England, born August 28, 1843, youngest of the four children born to William and Elizabeth (Farr) Edwards. He has a brother in Australia and the other two children are deceased. The father, a native of Warwickshire, England, died in Wales in April, 1844. The mother, a native of Herefordshire, died in Wales in the latter part of the eighties. Mr. Edwards reached manhood in his native country and engaged in farming there. He later secured the position of farm bailiff over a large estate. He was married in Wales in 1866, to Miss Elizabeth Wheelding, a native of that country, who died in 1880, leaving four children: Elizabeth, wife of Drapper Tappin, of Logan county, Nebraska, has six children; William also lives in Logan county; Thomas, of Los Angeles, California, has one child; Charles is married and living at Broken Bow, Nebraska. In 1881 Mr Edwards came to America, and after spending a few months in Ohio, came to York county, Nebraska, two years later removing to Custer county. In January, 1883, he secured a homestead of one hundred and sixty acres of land on the northwest quarter of section twenty, township seventeen, range twenty, where the family resided many years, and which is still in his possession. In 1901 he retired from farm life and purchased a comfortable home in Broken Bow, which has since been the family residence. He is a prosperous and successful man of affairs and at one time owned eighteen hundred acres of stock and grain farm land in Custer county; besides the farm land now in his possession he owns considerable desirable city property. He won the respect and esteem of his fellow citizens and takes a commendable, interest in the affairs of his county and state. On March 28, 1885, Mr. Edwards was married (second) at Broken Bow, to Mrs. Jene Hutchison, the ceremony being performed by Judge John A. Benjamin. Mrs. Hutchison, whose maiden name was Anderson, was born in Paesley, Scotland, and came to America in June, 1880. She was the youngest of ten children born to George and Jessie (Thompson) Anderson, the former a native or Carlisle, Scotland, and the latter of Glasgow. The father died in Scotland in August, 1867, and the mother died in her native country in March, 1869. Mrs. Edwards enjoyed excellent educational advantages and has traveled extensively. She is a woman of culture and high character, and has many warm friends. There are no children by the second marriage of Mr. Edwards. They are both identified with the Presbyterian church, Mr. Edwards being the ruling elder of the First Presbyterian church of Broken Bow. Mrs. Edwards connection with church dates back to early girlhood days. The versatility of the westerner is well illustrated in the life of George S. Graves, one of Butte's most prosperous merchants. His is a truly varied career, combining that of ranchman, landlord, judge and merchant, filling each with success, while he is still in the prime of life and capable of enjoying every good gift that falls to his lot. wagon and set out for a new location, going to Guthrie county and farming there for fifteen years, at which time they came to Nebraska. The old "prairie schooner" was again called into service in removing here, the trip being a long and hard one. They arrived in Fort Kearney in April, 1883, and after a few months at that place, not being entirely satisfied with their surroundings, they again started out, Long Pine, Brown county being their mecca, landing at that point in the spring of 1884. Here, the father and two sons filed on homesteads. Our subject lived on his claim for five years, then took up a timber culture and lived on it two years, then moved to the town site of Naper, in Boyd county, there opening a hotel, the building having been built in Brown county, and later purchased by Mr. Graves, taken apart and hauled in wagons across the river and through the rough country to its new location, where it was placed on a solid foundation and stood as a landmark for many years, still being in good condition. The postoffice building of the place was obtained in the same manner, and the entire town at that time consisted of four buildings, Mr. Graves owning three of them. As there was no lime to be had for use in plaster, etc., Mr. Graves followed the western custom in making the country furnish a substitute for the real thing. They secured a supply of the magnesia rock found in the locality, pulverized the same and mixed it with Buffalo grass in place of hair, and with this material the new hotel was plastered throughout, proving a most satisfactory substitute. Mr. Graves was elected county judge in 1894. and re-elected in 1896, serving up to 1899. At the expiration of his term of office, he opened a general store on Main street in Butte, and has been exceptionally successful in his business career. His stock included a complete line of dry goods, clothing and groceries, and has the patronage of many throughout the country, as well as a large town trade. Mr. Graves has lived through every phase or Nebraska life, experiencing, all the discomforts of pioneer existence, enduring hardships, suffering blizzards, drouths, Indian scares, etc., but through it all has never felt like giving up and moving to any other part of the country. To one at the present time riding through the highly developed farming surrounding Butte, clotted with fine big residences, beautiful groves and meadows, it is hard to realize that this wonderful. change has been brought about in the short space of a score of years, more or less. Our subject was married in Ainsworth, December 31, 1885, to Miss Mary Jamison a native born Nebraskan. They have five children, as follows: Oscar A., employed as salesman with Armour & Company, covering the territory through northern Nebraska; while Eva, Everett, Beatrice, and Bernice, remain at home, the last three still at school. Politically Mr. Graves is an independent. He is a member of the Odd Fellows, Knights of Pythias, and Modern Woodmen, and with his family, attends divine worship at the Congregational church. William E. Doll, devoted to agricultural pursuits, is owner of a fine home on section twenty-six, in Warsaw precinct, where he has made his name and influence felt as a capable and reliable citizen of Howard county. Mr. Doll was born in Grand Island, Nebraska, May 29, 1867, and grew to the age of six years in that vicinity, then with his parents came into Howard county, settling here about April, 1873. The father homesteaded and William helped develop the land into a good farm, remaining at home until about twenty-three years old, and then began working on farms, and the railroad. He was married on October 25, 1905, to Stena Sorensen, daughter of J. C. Sorensen, who is an old settler in these parts and has a fine estate near Boelus. There were eight children in the Sorsenson family, Mrs. Doll being the fifth in order of birth. After his marriage Mr. Doll took the management of the home farm, which is situated on section twenty-six, township fourteen, range eleven, consisting of one hundred and sixty acres, with good buildings and improvements. A brother of our subject, Carl H. Doll, lives on the farm adjoining the homestead to the west, and is, really a portion of the original home farm. He is married and has a family of four children. Joachim F. Doll, father of our subject, was born in Germany in 1826, and came to America in 1856, locating in Iowa, where the spent about one year, then settled in Hall county, Nebraska. He remained there for flfteen years, built up a good home, and then came on to Howard county, purchasing some land on sections twenty-six and twenty-seven, township fourteen, range eleven, and after putting up a rough shanty, sent for his family and together they worked hard to build up a good home. There were eight children, only the youngest born in Howard county, but all grew up there, and are well-known and highly respected. Mrs. Doll died in 1886, and her husband survived her until 1898. One son, August, lives in Seattle, Washington, Fred in Grand Island, three daughters, Minnie, Sophia, and Carolina, reside in Howard county, and Emma, in Hall county, while Carl H., and William E., are on the home farm.